During this time Jünger had a number of literary and philosophical influences. During the war, the experience of the front enabled him to resolve the triple influence of such late 19th century French writers as Huysmans and Léon Bloy, of a kind of expressionism that still shows up clearly in Battle as Inner Experience and especially in the first version of The Adventurous Heart, and of a kind of Baudelairian dandyism clearly present in Sturm, an early novel recently published. Armin Mohler likens the young Jünger to the Barrès of Roman de l’Energie nationale: for the author of the Battle as Inner Experience, as for that of Scenes et doctrines du nationalisme, nationalism, a substitute religion, a mode of enlarging and strengthening the soul, results above all from a deliberate choice, the decisionist aspect of this orientation rising from the collapse of standards after the outbreak of the First World War. The influence of Spengler and Nietzsche is also evident. 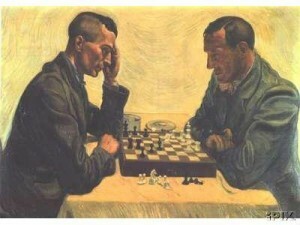 In 1929, in an interview given to an English journalist, Jünger defined himself as a “disciple of Nietzsche,” stressing that Nietzsche was the first to challenge the fiction of an abstract universal man, “sundering” this fiction into two concrete, diametrically opposed types: the strong and the weak. In 1922 Jünger passionately read the first volume of The Decline of the West, then the second volume as soon as it was released in December of the same year, when he wrote Sturm. However, as we shall see, Jünger was no passive disciple. He was far from following Nietzsche and Spengler in the totality of their positions. The decline of the west in his eyes was not an inescapable fate; there were other alternatives than simply acquiescing to the reign of “Caesars.” In the same way, if Jünger adopts Nietzsche’s questioning, it was first and foremost to bring it to an end. Ultimately, the war represented the strongest influence. Jünger initially drew the lesson of agonism from it. The war must cause passion, but not hatred: the soldier on the other side of the trenches is not an incarnation of evil, but a simple figure of momentary adversity. It is because there is no absolute enemy (Feind), but only an adversary (Gegner), that “combat is always something holy.” Another lesson is that life is nourished by death and vice-versa: “The most precious knowledge that one acquired from the school of the war,” Jünger would write, “is that life, in its most secret heart, is indestructible” (Das Reich, I, October 1, 1930, 3). Granted, the war had been lost. But in virtue of the principle of the equivalence of contraries, this defeat also demanded a positive analysis. First, defeat or victory is not the most important issue of the war. Fundamentally activistic, the national revolutionist ideology professes a certain contempt of goals. One does not fight to attain victory, one fights to make war. Moreover, Jünger claimed, “the war is less a war between nations, than a war between different kinds of men. In all the nations that took part in that war, there are both victors and vanquished” (Battle as Inner Experience). It was in the war, Jünger continues, that German youth acquired “the assurance that the old paths no longer lead anywhere, and that it is necessary to blaze new ones.” An irreversible rupture (Umbruch), the war abolished all old values. Any reactionary attitude, any desire to retrogress, became impossible. The energy that had been unleashed in a specific fight of and for the fatherland, can from now on serve the fatherland in another form. The war, in other words, furnished the model for the peace. In The Worker, one reads: “The battle front and the Labor front are identical” (p. 109). From 1926 onwards, Jünger called tirelessly for the formation of an united front of nationalist groups and movements. At the same time, he sought—without notable success—to change them. For Jünger too, nationalism must be alchemically “transmuted.” It must be freed of any sentimental attachment to the old right and become revolutionary. It must take note of the decline of the bourgeois world apparent in the novels of Thomas Mann (Die Buddenbrooks) or Alfred Kubin (Die andere Seite). From this point of view, what is essential is the fight against liberalism. In Arminius and Der Vormarsch, Jünger attacks the liberal order symbolized by the literati, the humanistic intellectuals who support an “anemic” society, the cynical internationalists whom Spengler sees as the true authors of the November Revolution and who claimed that the millions who perished in the Great War died for nothing. But at the same time, he stigmatizes the “bourgeois tradition” invoked by the nationalists and the members of the Stahlhelm, these “petit bourgeois (Spiessbürger) who, because of the war, slipped into a lion’s skin” (Der Vormarsch, December 1927). Tirelessly, he took on the Wilhelmine spirit, the worship of the past, the taste of the pan-Germanists for “museology” (musealer Betrieb). In March 1926, he coined the term “neonationalism,” which he opposed to the “grandfather nationalism” (Altvaternationalismus). Jünger defended Germany, but for him the nation is much more than a country. It is an idea: Germany is everywhere that this idea inflames the spirit. In April 1927, in Arminius Jünger takes an implicitly nominalist position: he states that he no longer believes in any general truths, any universal morals, any notion of “mankind” as a collective being everywhere sharing the the same conscience and the same rights. “We believe,” he says, “in the value of the particular” (Wir glauben an den Wert des Besonde­ren). Around Jünger a “Berlin group” soon formed, where representatives of various currents of the Conservative Revolution met: Franz Schauwecker and Helmut Franke; the writer Ernst von Solomon; the Nietzschean anti-Christian Friedrich Hielscher, editor of Das Reich; the neoconservatives August Winnig (whom Jünger first met in the autumn of 1927 via the philosopher Alfred Baeumler) and Albrecht Erich Günther, co-editor with Wilhelm Stapel of Deutsches Volkstum; the national-Bolsheviks Ernst Niekisch and Karl O. Paetel; and of course Friedrich Georg Jünger, Ernst Jünger’s younger brother, who was also a recognized theorist. Friedrich Georg Jünger, whose own development is of great importance to that of his elder brother, was born in Hanover on September 1, 1898. His career closely paralleled his brother’s. He too volunteered for the Great War; in 1916 he saw combat on the Somme and became the leader of his squad. In 1917 he was seriously wounded on the front in Flanders and spent several months in military hospitals. He returned to Hanover at the end of the hostilities, and after a brief period as a lieutenant in the Reichswehr, in 1920 he decided to study law, defending his doctoral dissertation in 1924. 1. Cf. Henri Plard, “Une oeuvre retrouvée d’Ernst Jünger: Sturm (1923),” Etudes germaniques, October-December 1968, 600–615. Published: April 13, 2011 | This entry was posted in North American New Right and tagged Alain de Benoist, conservatism, conservative revolution, Ernst Junger, Friedrich Georg Jünger, Friedrich Nietzsche, Johnson translation, modernity, North American New Right, on Jünger, originals, Oswald Spengler, technology, the figure of the worker, the Weimar Republic, translations, World War One. Both comments and trackbacks are currently closed. Does an English translation of ‘Battle as Inner Experience’ exist? Worldcat.org is a useful place to search for information on the editions and translations of particular books. One needn’t be a “cynical internationalist” to realize that those who died in the wildly dysgenic Great War did indeed die for nothing.